Great at last to sit in the garden this evening and wind down after a busy day. God has indeed given us all things richly to enjoy. The garden is looking lovely. 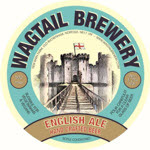 And the beer is Wagail Brewery's English Ale. Very tasty.